As you may be aware I love painting my nails but I really can't be faffed having to wait around forever for nail varnish to dry. If I'm doing some nail art I often use a top coat to set my base colour before going on to decorate it and this means I need the top coat to dry as quickly as possible so I can move on to the next part. I'm a big fan of Seche Vite Dry fast top coat, but I'm certainly not a fan of it going off half way through, especially when it's not particularly cheap. 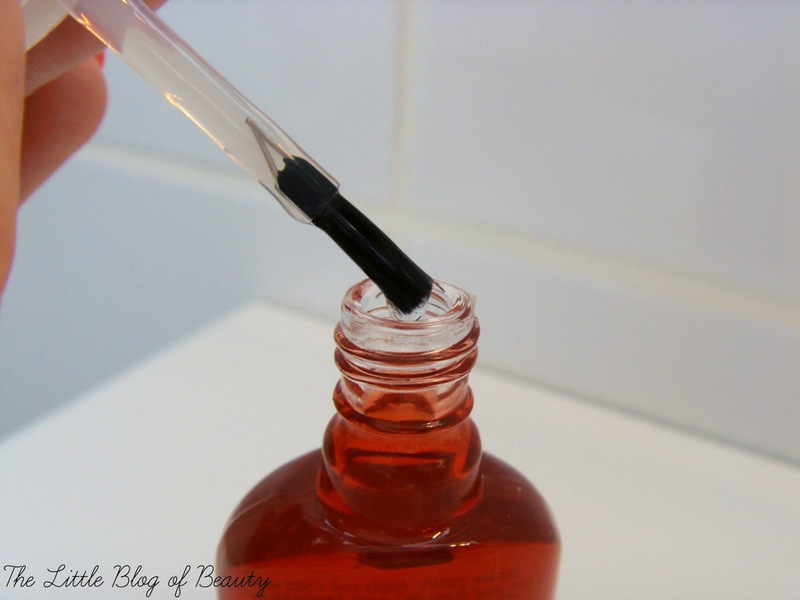 Back in January I blogged about Ciate's Speed coat thinking I'd found an answer to my being able to get to the bottom of the bottle shaped prayers. Maybe a quarter of the way through Speed coat I noticed that it was starting to get stringy and then one day while I was battling a cobweb effect of stringy top coat all over the place (seriously, it was everywhere!) I discovered it had gone the same way as Seche Vite and was far too thick and gloopy to use anymore. So in the bin it went (along with my my bottle of Seche Vite that I had for some reason been keeping hold of, maybe in the hope the top coat saving fairies would visit and rescue me!). I was really disappointed with Speed coat as it's even more expensive than Seche Vite and it was only one of the mini bottles that I had, so a full sized bottle may not even last down to half way. 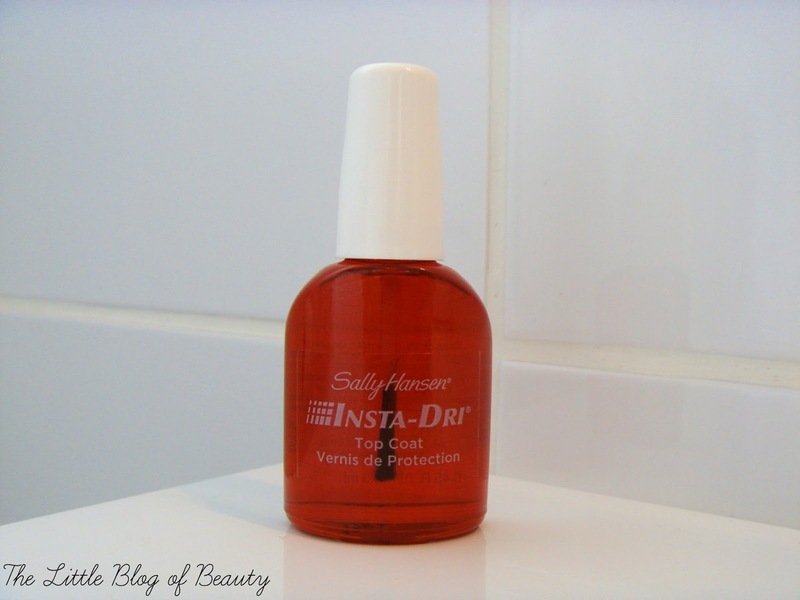 I appealed on Twitter for suggestions for a good quick drying top coat and was directed towards Sally Hansen's Insta-Dri (which I've just realised I've been spelling wrong, well actually spelling correctly but not the way Sally Hansen are spelling it!). A quick check on the Boots website (when it decided to work) revealed that this was only £5.99 (bargain!) so when I placed an online order I popped this in my basket to make up a 3 for 2 order. As I have only used this a couple of times I currently have no idea whether this will go off half way through like Seche Vite and Speed coat, but as this is around £3/£4 cheaper than the others (depending where you purchase from) I won't mind so much if it does happen. Overlooking whether or not I'll be able to get through the whole bottle, so far this is exactly what I want. Within a couple of minutes my nails are dry (it's probably actually even quicker than this) and not just 'touch' dry they are actually quite tough. I'm usually still reasonably cautious of them as they can still dent if you hit them on something, and I would leave them for a little longer if I'm going to be applying anything over the top for nail art, but in general I can get on with whatever I need to do. I would say be careful how much you have on the brush as if you've not taken enough off using the edge of the bottle it can flood your nail and then might dry a little bubbly. A thin coat is definitely best and obviously will dry quicker than a thicker coat. It's leaves an amazing glossy finish and does appear to keep chips away on my 'chip within 24 hours' nails. I can't comment on how long your manicure might last using this as I tend to change my nail varnish every few days anyway (read - I've started picking it off within a few days!) but I would say if you're looking for something chip resistant this would be a good place to look. This is definitely my new favourite top coat and once I have got to half way through I'll update you on whether the dreaded stringiness and gloop has made an appearance. 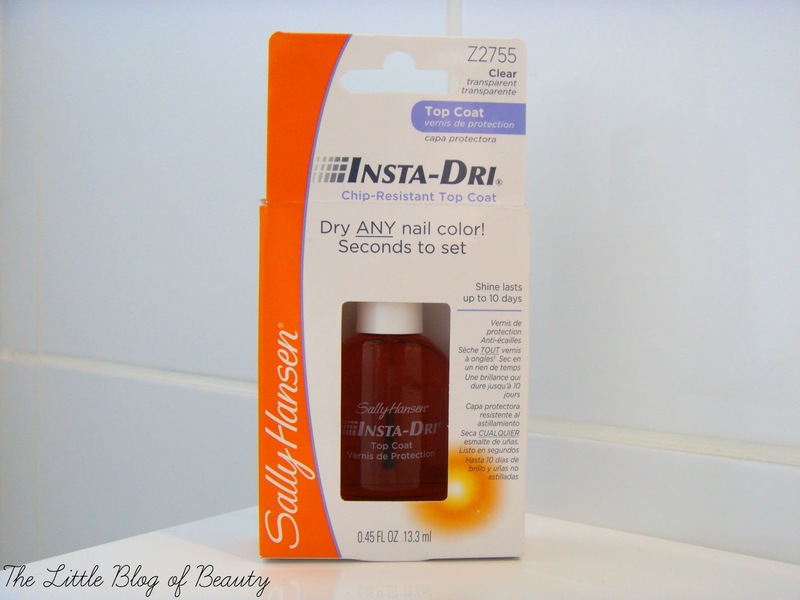 Sally Hansen Insta-Dri chip-resistant top coat is available for £5.99 from Boots. This sounds amazing, I'm obsessed with Seche Vite but it is a tad pricey so I'd love to see how they compare :). 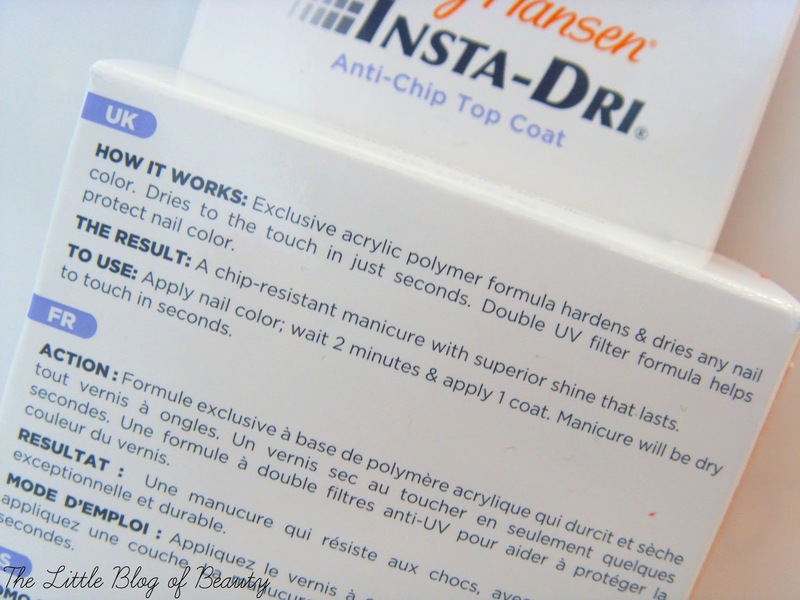 Super interesting post, I'm always ruining my nails by banging them on things, so this could be my life saver! !